Karen Clark grew up in North Delta and was active in many sports. She attended Gray Elementary, Sands Junior Secondary and graduated from North Delta Senior Secondary School in 1996. Karen participated in track and field in elementary school, and in high school competed in cross-country running. While in high school Karen developed her passion for rowing and was fortunate the Delta Deas Island Rowing Club provided high school students with training programs and competitions. From 1994 – 1996, Karen won 14 medals in singles, pairs, fours and eights at British Columbia, Western Canadian and Canada Cup regattas. Graduating in 2001, Karen attended the University of Victoria where she obtained a Bachelor of Fine Arts degree in Art History. After UVic, she attended The Emily Carr School of Art as well as BCIT, where she completed a Diploma in Graphic Design. While at UVic, Karen was a member of the Women’s Varsity Rowing Club that won the Canadian University Championships four years in a row, competing in Varsity eights, pairs and singles. In 1999, she won gold in pairs and eights at the Canadian Henley Regatta in St. Catherines and won gold medals in the eights, eight dash, fours and pairs at the Canada Cup in Montreal. The Women’s Eights went on to win the 2000 Women’s British Royal Henley. Rick Crawley, the UVic coach stated, “Karen is the heart and soul of our team – our best rower of 2000. She works hard and leads by example.” In 2000, Karen was awarded a Varsity Highlight Award presented to student athletes whose positive attitude contributes to sport and academics. 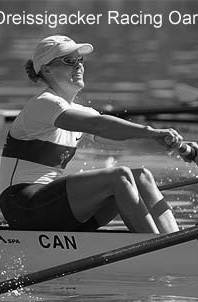 Karen’s time with the Canadian National Rowing Team was equally impressive and spanned the years 2000 – 2004. In 2001 – 2003, Karen and her partner Jacquie Cook won the National Championships in pairs. Karen had incredible success on the international scene in pairs and eights. After winning a bronze medal in Women’s pairs at a World Cup event, Karen and her partner won a bronze medal at the World Championships in Lucerne, Switzerland. During the 2002 season, she again won a bronze medal at a World Cup event in Munich and a silver medal in pairs at the World Championships in Seville, Spain. 2003 was an important year in rowing as teams were trying to qualify for the 2004 Olympics. Karen’s success continued as she won a gold medal in pairs and a bronze in the eights at a World Cup regatta in Lucerne. Karen’s Eights team were also the 2003 champions at the British Royal Henley Regatta. In 2004, Karen won a silver medal in pairs at a World Cup regatta in Munich and was chosen to represent Canada at the 2004 Olympic Games in Athens. Karen was a proud member of the Canadian Olympic Team, competing in the Women’s Eights.